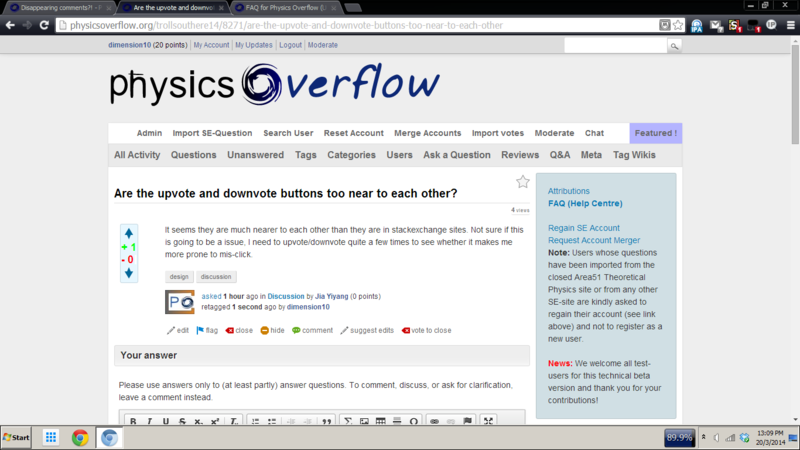 It seems they are much nearer to each other than they are in stackexchange sites. Not sure if this is going to be a issue, I need to upvote/downvote quite a few times to see whether it makes me more prone to mis-click. Polarkernel has now fixed this. Looks fine on posts with text. but not on lists of questions. Unfortunately, Q2A uses the same design for both. It would be feasible to use different designs, but this would be a larger change (takes time). To me it seems, the arrows are more separated on the question lists too (?). And by the way it is always a good idea to judge a question not only by its title, but vote after reading it ... :-P. So, to me it seems good enough :-). @Dilaton Yes, that's what I'm saying, because it is the same design. But if the arrows have to be put above and below the vote count, as in the picture of diemsnion10, then the whole packet is too high in question lists. Dimension10 seems to be happy with it as is now too, as he wrote [DONE] in the corresponding answer to the road map. @polarkernel Thanks, I think this is fine. It looks better, thank you all.